Dimensions: total height 83cm, seat height 45cm, depth 60cm, width 66cm, weight 6,2kg. Standard colors: linen, dove grey, orange, red, light green, anthracite grey. Fire-retardant colors: linen, light grey. 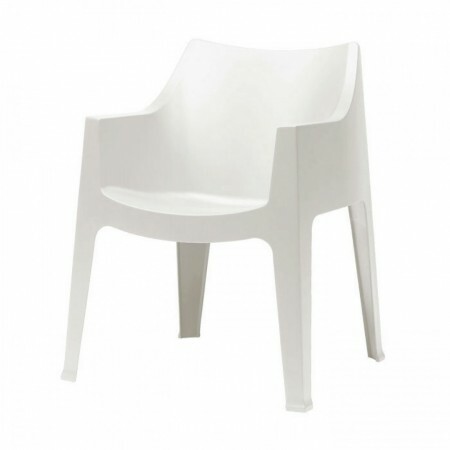 Coccolona, is an armchair of great charm and practicality. Perfect for any indoor or outdoor space, Coccolona is declined in a wide and lively chromatic range. Equipped with non-slip feet, Coccolona is extremely comfortable and characterized by refined and elegant shapes. An armchair able to integrate perfectly into any context, transforming the spaces with a touch of class. Ideal for both domestic and contract projects. Coccolona armchair is made of technopolymer using air molding technology, stackable. Also available in the fireproof variant: characteristic thanks to which its combustion is greatly reduced and delayed. Can be combined with the equally comfortable Coccolona sofa, see below in related products.